Elisabeth was inspired to create PopUp Storywalk after vacationing in upstate New York where she stumbled upon a StoryWalk trail. Juliet, her oldest daughter, was full of excitement and awe, running up ahead to spot the next display which contained the next page of the story. She would squeal with joy when she found it, and run back to get daddy's hand to lead him to her new discovery. This process repeated over and over until the hike was done, and the story finished. Never did Juliet complain about how tired her legs were or ask if the hike was almost done..... she was IN an adventure and she loved every moment. After hearing Elisabeth's enthusiasm for this project, Jasmin and Beth quickly joined the team. They loved the idea of pairing early childhood literacy with encouraging outdoor play and are thrilled to be able to share this project with the community! 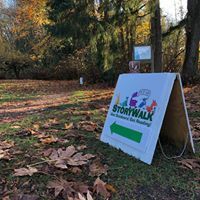 Our hope is that through PopUp Storywalk, more children and families can have this wonderful experience and will look forward to their next adventure! ​Through PopUp Storywalk, we aim to encourage a lifelong love of learning and an appreciation of the outdoors. PopUp Storywalk is designed to rotate a variety of children's books as it travels to different destinations. We hope to inspire families to follow our installations and experience a new featured book, in a new location, every season. ​We are driven by the smiles, giggles and joy filled moments we see and hear from all the families who have experienced PopUp Storywalk. We are so thankful PopUp Storywalk has received so much love and support from our community! ​The StoryWalk Project was created by Anne Ferguson of Montpelier, VT in 2007 and was developed in collaboration with the Vermont Bicycle & Pedestrian Coalition and the Kellogg-Hubbard Library. The name StoryWalk is a registered trademark. There are now StoryWalk installations all over the country.